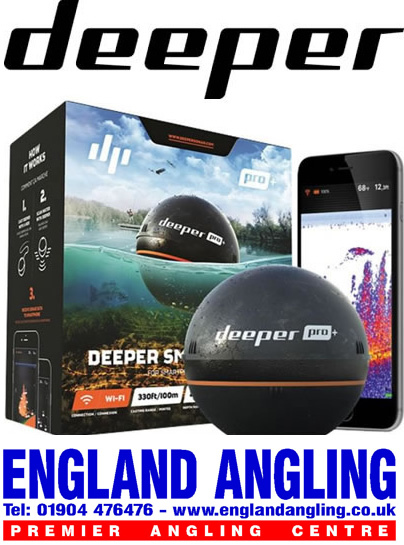 DEEPER Pro+ NCLUDING FREE KORDA SPINNER RIG BUNDLE(deep02) £199.99 FREE DELIVERY! The Deeper PRO+ is the most powerful castable sonar available – it casts further and scans deeper than any other. With its wide range of settings and modes, it’s also incredibly versatile – scan for structure, map contours from shore or boat, mark fish, find vegetation. All so you never miss any of the underwater action. The DEEPER PRO+: The ultimate in smart sonar fishing, the Deeper Smart Sonar PRO+ uses integrated GPS to turn your Deeper into an amazing mapping device. Boasting a WiFi connection that enables great range and huge data transmission, what sets the PRO+ apart is its integrated GPS. This enables you to create real-time bathymetric maps of the site you’re fishing from both boat and shore. This allows you to pin point exact features in a way that was only previously possible using boat-mounted consoles. With an 80m / 260 ft range and a scanning to a depth of 80m / 260 ft, this GPS enabled, map-making device is ideal for the most demanding anglers and the most extreme conditions.